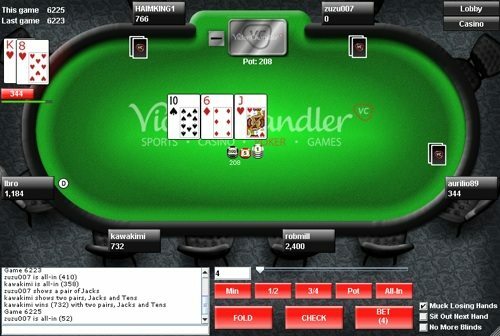 BetVictor Poker, which used to be called VC Poker, has been around in one form or another for many years on different poker networks. It now calls the MPN network home and has streamlined its bonus procedure. Instead of entering any codes, you’ll automatically be issued your bonus upon making your qualifying deposit. Follow our links to get started playing poker at BetVictor today! Once you click on our links and create your account, simply make your initial deposit to be rewarded with a 200% up to $1,000 bonus. Your bonus will release in 10 equal installments at a rate of 8 Action Points per bonus dollar. For example, if you deposit $200 to receive a $400 bonus, you’ll be paid in chunks of $40 each, and every piece will be awarded once you earn 320 Action Points. You have 30 days from the time of your deposit to earn as many of the 10 bonus pieces as you can. After this time, the remainder of your bonus will expire. By making your first deposit at BetVictor, you’ll be able to enter special €500 New Player Freerolls and €500 Gtd New Player Turbo tournaments every Wednesday for your first six weeks at the poker site. As we’ve just stated, your bonus will clear at a rate of 8 Action Points per dollar. You’ll receive Action Points at a rate of 2 for every dollar you pay in rake or tournament fees. In order to fully clear the maximum $1,000 bonus, you’ll be required to earn 8,000 points by raking $4,000. This works out to a cashback rate of 25%. 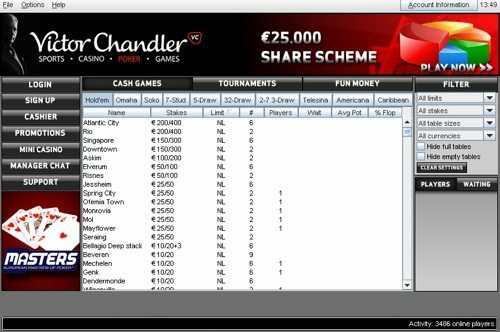 You can play 2,000 $20 + $2 sit and go tournaments to reach this rake total. If you’d prefer to earn your bonus at the cash game tables, then about 75K hands of 100NL full-ring should do the trick. Look at the clearing numbers at the right side of this page for detailed information on how quickly you can clear the bonus at various different games. If you play at low stakes, you should size your deposit in such a way that you’ll be able to easily clear the bonus portions. With only 30 days to fulfill the bonus conditions, you should plan carefully so that you can get the most out of this bonus. Increase your level of rewards by partaking in the BetVictor VIP Programme. The levels range from Bronze up to Diamond and are determined by the amount of action points you earn in a month. Raking as little as $500 in a month is enough to make you a valued Diamond VIP. The higher your VIP level, the larger percentage of your action points you’ll be able to turn into cash at a rate of 5 action points per dollar. With the remaining points, you can buy into tournaments at a rate of 100 points per dollar. Returns as high as 30% rakeback equivalent are possible with the VIP Programme. Sign up today at BetVictor using the links below, and claim your $1,000 bonus + VIP rewards today.